LPG storage options are flexible and can be designed to suit your use, property and planning requirements. Our team of Gas Safe Registered engineers are on hand to advise which storage will best meet your needs and ensure the installation complies with UKLPG Codes of Practice. Further to this our engineers work with you to ensure that the installation process causes as little disruption as possible to your business or property. In the majority of cases Domestic users only require one tank. LPG storage options at Metered Estates will depend on the number of properties to be serviced by the communal LPG installation and the land available for the development. We have worked successfully with several developers to install multi tank communal LPG Infrastructures capable of servicing multiple properties. LPG is a versatile fuel allowing our Commercial customer base to range from poultry farmers to hotels and restaurants. Fortunately LPG storage options are flexible and we are confident that whatever your business requirements we can find a solution to meet your needs and satisfy our industry approved codes of practice. We recommend calling us on 01772 707011 to discuss your requirements and arrange a site inspection. Key: (L) Length, (W) Width, (H) Height. See illustrations (below). 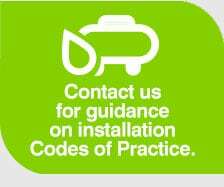 The Codes of Practice recommend that tank(s) are sited 3 metres (7.5 metres for 4,600 litre aboveground tanks) from any building, boundary or fixed source of ignition. There is some flexibility with these guidelines provided our engineers are satisfied the installation is sufficiently ventilated and free from obstruction. There must be nothing overhanging or above the tank (for example tree branches or telephone cables) and if you require a multi tank installation then you will need to observe a 1 metre separation distance between tanks. Please note you will be required to provide the concrete base and pipework trench for aboveground tanks or the excavation and pipework trench for underground tanks. Our engineers will then arrange a convenient date to install and commission the tank(s) and pipework. Key: (L) Length, (W) Width, (H) Height, (D) Depth. See illustrations (below). If you already have a tank(s) installed and supplying your property, estate or business then changing your supplier is simple, free and we will handle the transfer process from start to finish on your behalf. Please see Domestic, Metered and Commercial for more details.